With interactive whiteboards and touchscreen displays, digital annotation is a prime feature. But InFocus' Mondopad also carries a boatload of other features, including video calling, Internet access, remote markup and the ability to save and share content. 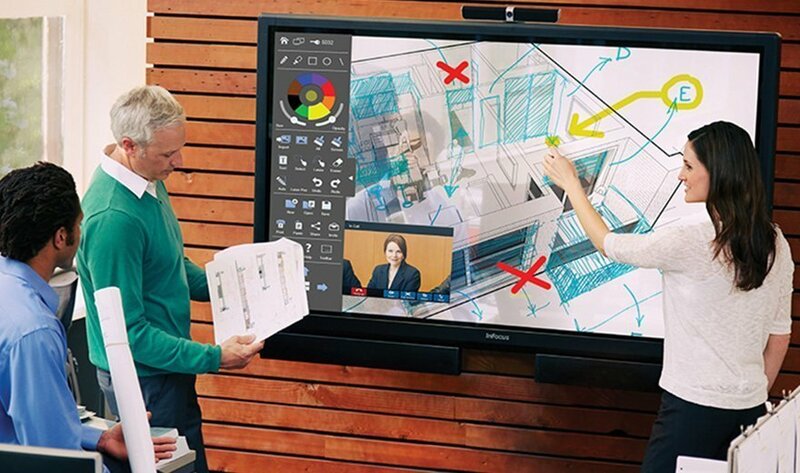 The Mondopad, like other large touchscreen displays, aims to smooth out the meeting and conferencing process so users aren't fumbling with PCs and wires. These devices could potentially replace old conference room equipment like projectors, desktop computers and projection screens. With the Mondopad, users can email presentations to the device, which is treated like another PC on the network and operates on a Windows 7 system. Users can also share their devices' screens to the Mondopad wirelessly via LightCast technology; so what appears on your tablet will appear on the Mondopad. The device also has USB drives and Dropbox support. In addition to its touchscreen displays, InFocus makes various software products, including a SIP-based video meeting application and other cloud-based video conferencing software. Mondopad users can also install third-party video calling services. If all these features are overwhelming, users can deactivate some of them to simplify the experience, said Glenn Jystad, director of product marketing at InFocus. "It can be daunting because of the many features it has, but it doesn't scare customers away," he said. "They realize they can grow into the full capabilities over time." Despite all of its features, the Mondopad still has a focus on annotation and touch technology. Annotation is available in every context, Jystad said. Users can mark up a digital whiteboard, PowerPoint presentations, Word documents, spreadsheets, videos and even Web pages. The Mondopad has a 120 Hz refresh rate, which means the touch responsiveness of the annotation software is sufficient for a smooth interaction with the device, Jystad said. InFocus is in the process of deploying projected capacitive touch technology on its large screens. The device employs an infrared multi-touch system and does not use any specialized stylus pens. The Mondopad features three sizes: 57-, 70- and 80-inch models that can be wall-mounted or set on a stand. InFocus also makes other touchscreen displays, including its JTouch and BigTouch models. Photo: InFocus' Mondopad boasts a bevy of features, including ink and touch technology, and video conferencing. Large interactive touchscreens have several capabilities. Which collaboration features interest you the most?